Already dubbed "Oldchella," a new festival is set to take place this fall that is sure to draw in a huge crop of intergenerational music fans. In what seems like a lineup too good to be true for fans of classic rock, the bill boasts the Rolling Stones, Paul McCartney, Bob Dylan, the Who and Roger Waters. 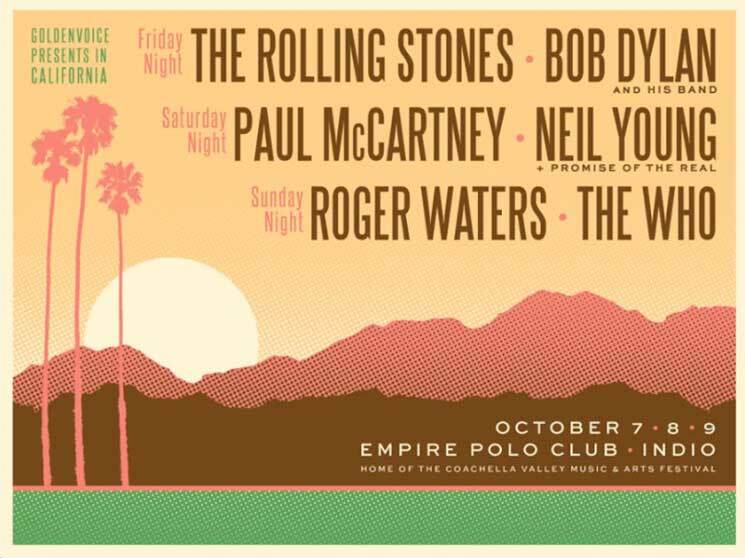 The festival was previously rumoured to take place from October 7 to 9 at the Empire Polo Field in Indio, CA — the desert town best known for hosting Coachella each year. UPDATE (5/3, 11 a.m.): The festival has now been officially confirmed. Dubbed Desert Trip, it will officially take place at Indio, CA's Empire Polo Grounds from October 7 to 9. The Rolling Stones, Paul McCartney, Neil Young, Bob Dylan, the Who and Roger Waters will indeed all be playing, and more acts will be announced in the future. You can get more info about tickets and pre-sales at the festival website here. UPDATE (5/9, 2 p.m.): A second weekend of the festival will now take place from October 14 to 16. Now, the massive list of aforementioned artists have confirmed that something is in the works for this fall, posting teaser videos across their respective social media pages simply stating: "October." Previous reports have also tapped Neil Young as one of the festival's performers, though the Canadian folk icon has yet to issue any official word of his involvement. According to the L.A. Times, each act will be given the stage for a full set — opening on October 7 with Dylan and the Rolling Stones, followed by October 8 sets from Young and McCartney, before wrapping up on October 9 with the Who and Waters. Check out the five mysterious video trailers below.